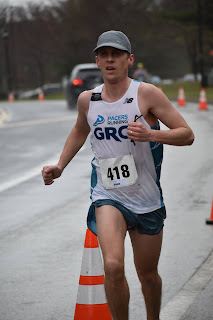 The conditions at the RRCA 10 Miler were sub-optimal to say the least, but the cold rain did not dampen the spirits of our intrepid crew. Congratulations to the women who got the win by a comfortable margin against solid competition. 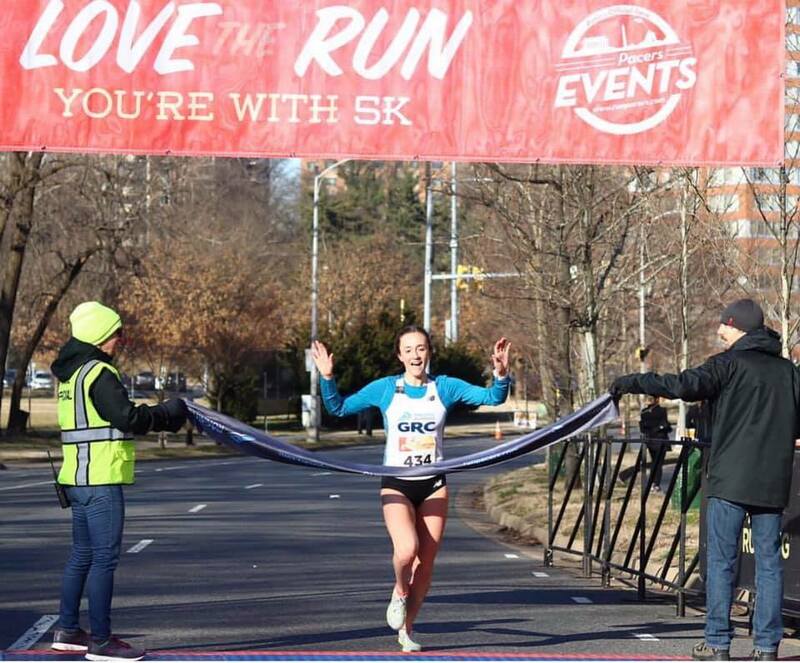 Kerry led the way, finishing 3rd in 61:54, followed by Natalie in 6th in 63:22 which was a 24 second PR, Margaret in 7th in 63:37, Liz R in 9th in 64:05, Hallie in 14th in 66:33, and Chelsea V in 16th in 66:46. Well done, ladies! 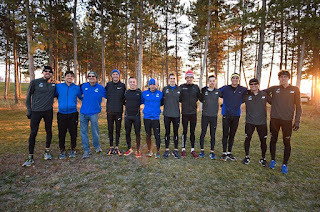 Because of several late scratches due to illness and injury the men were unable to field a full team, but the guys that got on the starting line ran well. Kyle made a promising return to racing in 54:21, followed by Zak in a PR of 54:54, Charlie in 54:57, Cabell in 55:07, Max in 55:46, Trever in 56:26, and Sean in 58:49. That Natalie and Zak were able to PR in such awful conditions on a very hilly course is a great sign that we're going to see more PRs from him them both this spring. The conditions were perfect at the Boston University Last Chance meet, where Tom ran an excellent 1:58.41 800. Tom had not broken 2:00 since 2011, and he was extremely pleased to see that he still has some speed after moving up to longer road distances. It was a weekend for the record books on the track, with two club records for the men. Lucas Stalnaker crushed the club record in the 3000, running 8:11.73 at the University of South Carolina Open, which was a 2 second PR. 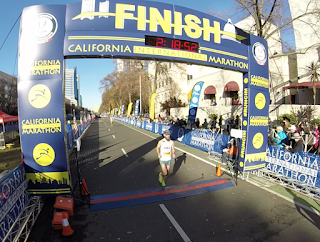 Lucas had some pacing help early, but he was totally solo the second half of the race and lapped almost the entire field. Daniel Trettel broke the club record in the 800, running 1:53.63 at the Penn State Tune Up. 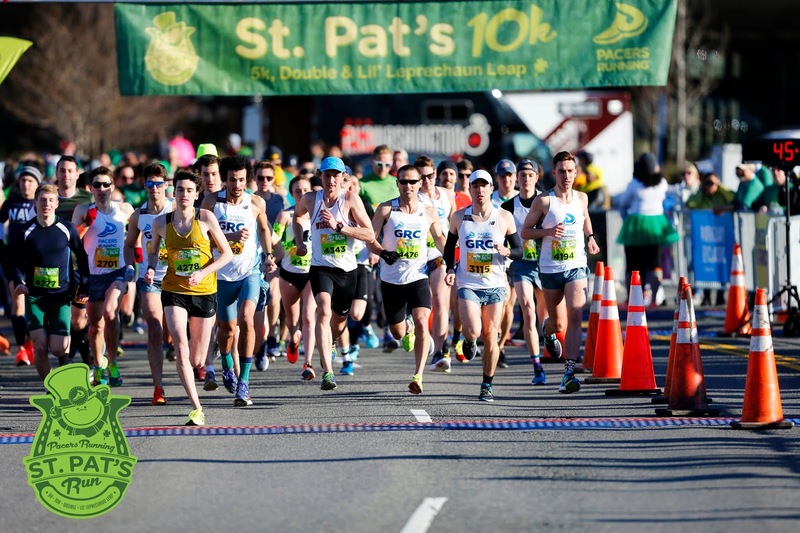 Daniel got caught up in traffic at the start and was not able to get running room for the first 200, causing him to go out slower than he intended, but he was able to run relatively even pace throughout. The women also got in the action, with Liz getting the win in the 1000 at the Princeton Invitational in 3:02.72, which is the second fastest time in club history. Liz was totally solo the entire race, and had been sick all week, so that was an extremely impressive performance. 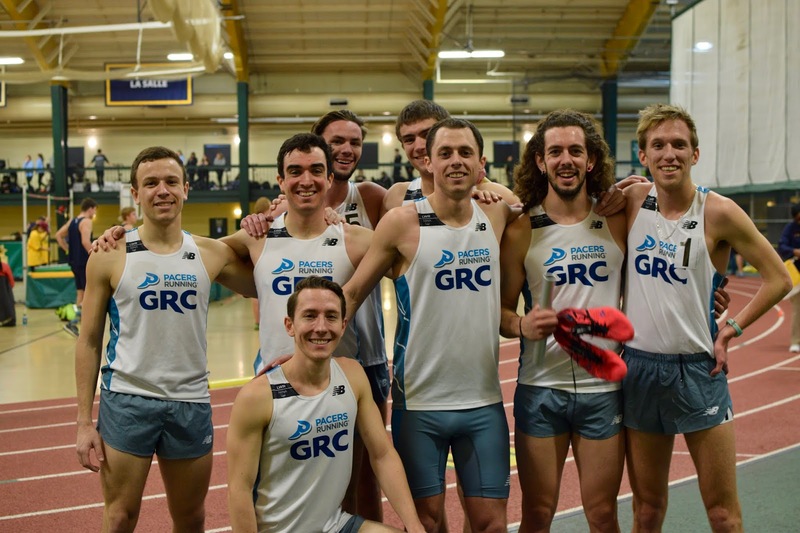 Weekend Recap (February 9 and 10): Millrose Games! We had a great day at the Millrose Games, with both of our A teams finishing a well-earned second place, and both of our B teams finishing sixth. Caroline led off for the A team in 3:40.3, which put us in the thick of the race. 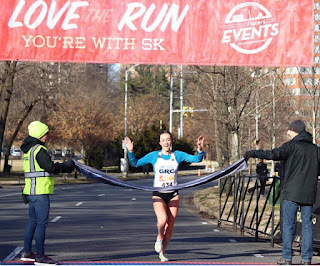 Alex ran a very strong 58.2 despite being impeded in the exchange zone, and when Jesse was done with her customary strong carry in 2:15.3, the race for second was down to us and NYAC. 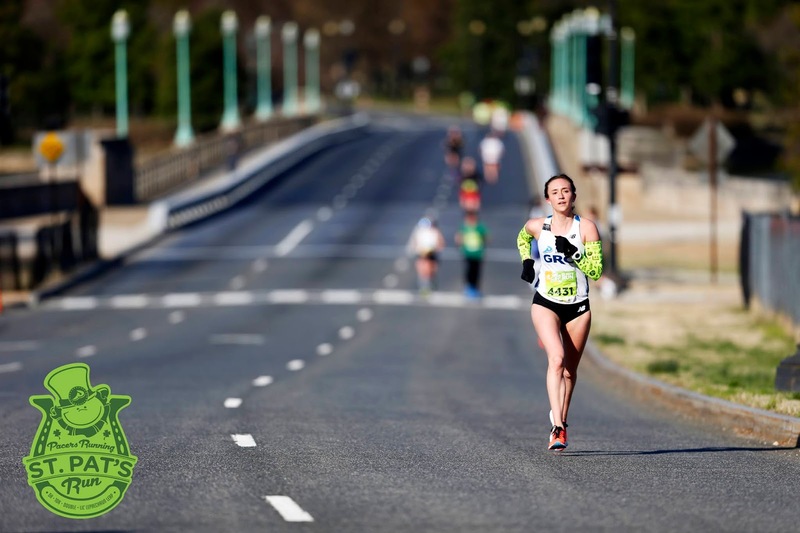 Gina got on the shoulder of her NYAC counterpart, who pushed the pace hard in an effort to shake Gina. 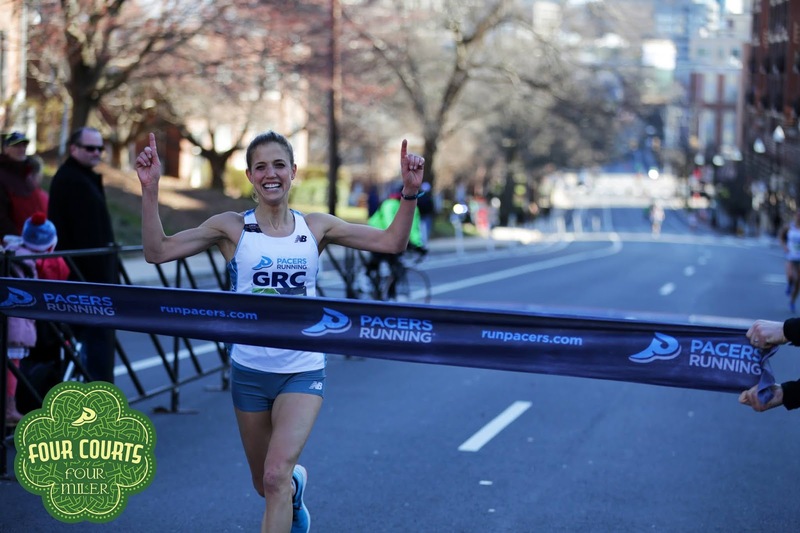 That effort proved to be futile, as Gina stayed patient, and with 150 to go she unleashed a huge kick, finishing in an excellent 4:51.8, for a time of 11:45.79. Gina ran the fastest leg of the day by over 2 seconds, and it was the fastest anchor leg in GRC history. 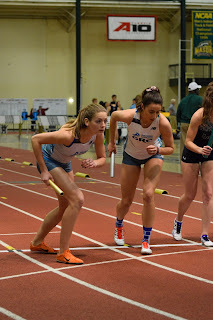 The B team ran so well that after extremely impressive legs from Jackie in 3:39.7 and Sarah C in 58.1, they were in second place, a step ahead of the A team. Angelina ran a solid 2:18.1, and Liz T anchored in a strong 5:07.5, for a time of 12:03.4. 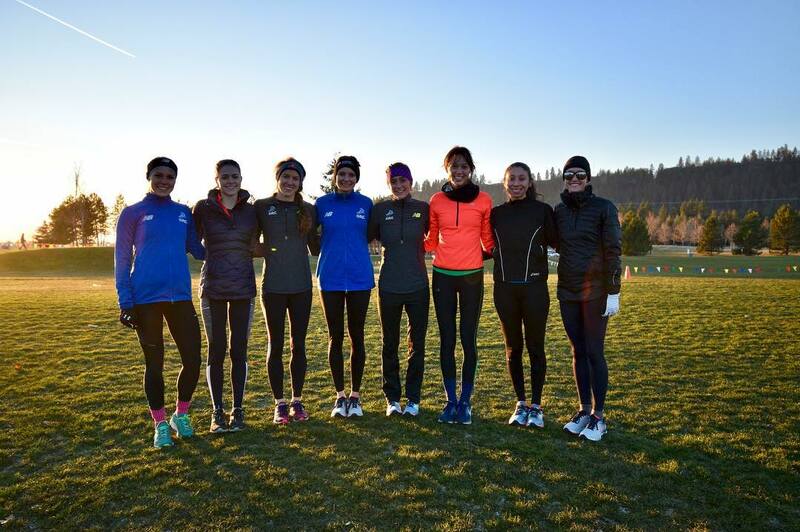 It's a testament to the depth of our women's track group that our B team was stride for stride with the A team for 2 legs. Sam C got the men's A team started in 3:07.5, and handed off in third, just behind the leader. Alex ran an outstanding 51.1, and he moved us up to second. 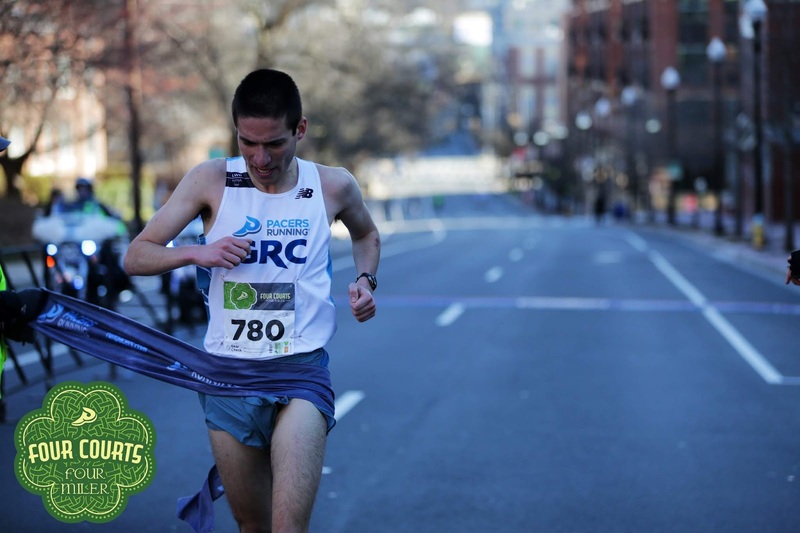 Daniel got the baton 1.4 seconds behind Garden State TC, and at the end of his excellent 1:53.5 leg, we were in a dead heat with Garden State and Penn. 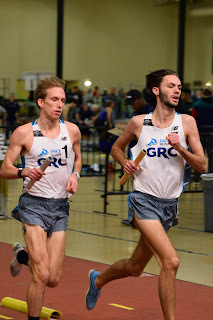 The Garden State anchor has broken 4 minutes, and after an extremely fast opening 400 Dan wisely let him go, and he and the Penn anchor were in a pitched battle for second for 7 laps. Dan made his move with 200 to go, and brought it home in an outstanding 4:09.3, which was a big PR. Our time of 10:01.45 was 1.5 seconds than our winning time last year, and thus is a club record. Max led off for the B team in a very impressive 3:08.6. Craig ran a strong 53.5, and handed off to Tom in 6th place. 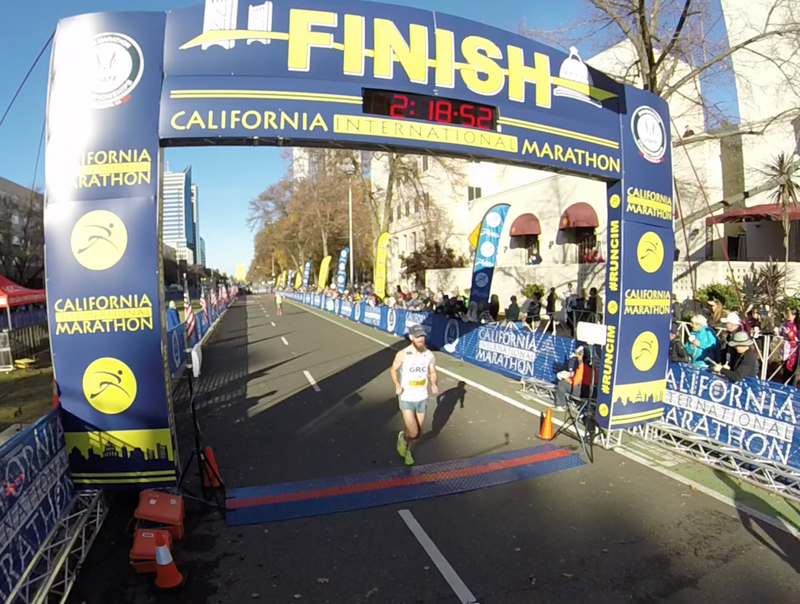 Tom went by the man in front of him in the first 100 meters, and ran the rest of his leg solo, finishing in a solid 2:00.8. 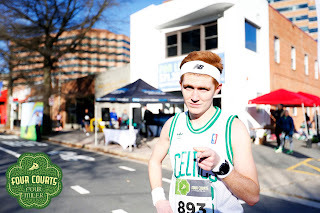 Luk anchored in a strong 4:23.5 off of a very brief track-focused training cycle, for a time of 10:26.58. Closer to home, we had a sizeable crew at the Pacers Love the Run You're With 5k. 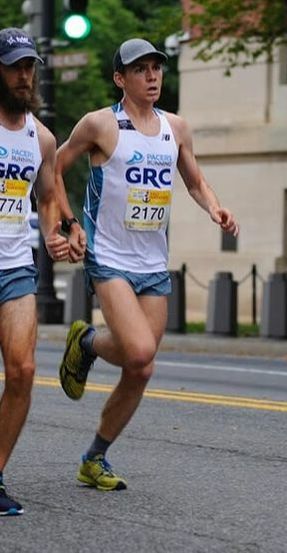 Lars Benner made an impressive return to racing after a long injury layoff, placing second in 15:51, followed by David Wertz in 16:06, Charlie Ban in 16:25, and Dickson in 16:40. 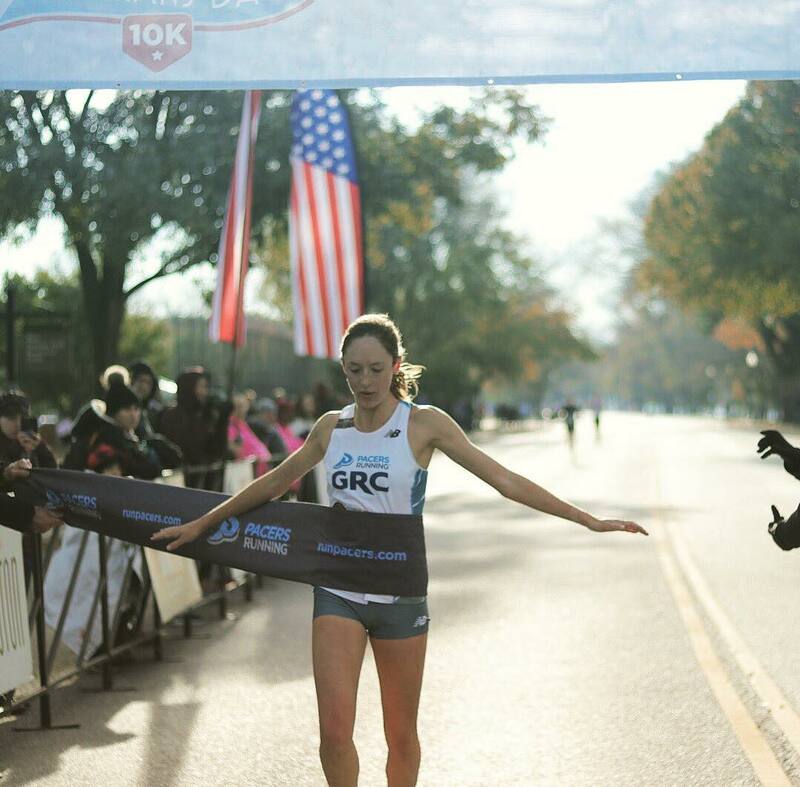 For the women, Natalie got the win in 18:01, which was a 12 second PR. Erin Melly was second in 18:28, followed by Rebekah Hernandez in 19:39, Chelsie Pennello in 19:43, Alexa Squirini, making her return to competition after a long injury layoff in 20:21, and Molly Applegate, who got stuck behind the walkers at the start, in 20:23. 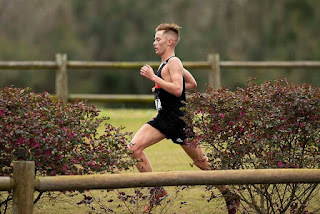 Our active duty military crew was in action on Saturday, February 2nd, at the USATF XC Championships in Tallahassee, Florida. Lucas Stalnaker finished an outstanding 20th place in a loaded field, and came agonizingly close to making his first national team, missing out on qualifying for the NACAC XC squad by one spot. That disappointment does not diminish Lucas's great race--he ran 30:13 for 10,000 on a fairly hilly course, and he beat numerous national class athletes. Lucas will keep the momentum going into track season, and he's got a real shot to qualify for outdoor nationals in the 10,000. Well done, young fellow! The rest of our crew also ran well. 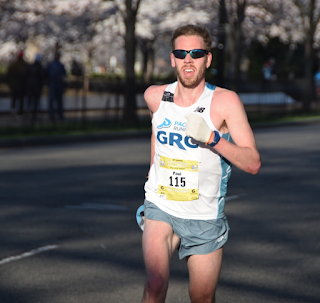 Sean Barrett was a strong 49th place in 33:45, and Ryan Spier, who is beginning to work his way back into shape, was 57th place in 34:49. 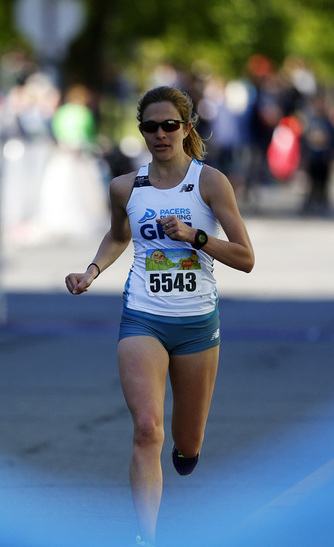 On the women's side, Kelly Calway was a solid 45th place in 39:00. 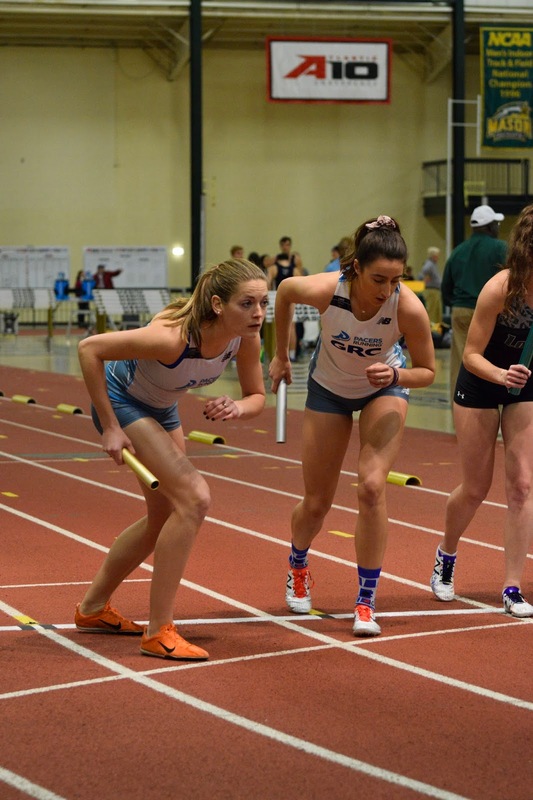 Our Distance Medley Relay (DMR) crew was out in full force at the George Mason Patriot Games. 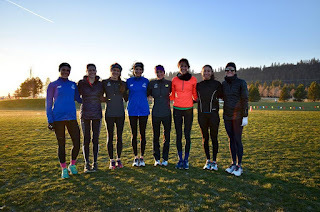 We ran split squads in order to bring our own competition and the women couldn't have been more evenly matched, as the A team ran 12:02.1, and the B team ran 12:03. Gina led off for the A team in 3:39, followed by Sarah Cook, who made an excellent GRC debut in 58.14. Jesse ran 2:15, and Liz T anchored the team to victory in 5:09. Jackie led off for the B team in 3:42, followed by Alex in 58.4, Angelina in 2:21.9, and Caroline in a very strong 5:00.3. Gina came back in the open 400 in 61.38. 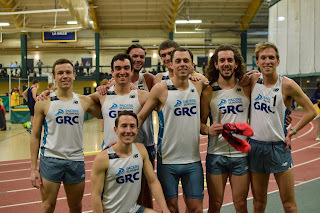 The men's A team got the win in 10:25.62. Sam C led off in a very controlled 3:12.5, closing in 29 for the last 200, followed by Tom in 56.6, and Craig in 2:01.1. Dan Meteer made an outstanding GRC debut, anchoring the team to victory in 4:14.76. Dan is a 2018 Brown graduate, and he is going to be a great addition to our track and road crews. The B team was third in 10:37.31. Luk led off in 3:14.6, followed by Alex in an excellent 51.8, Daniel in 1:56.4, and Max, making his indoor debut, in 4:34. Daniel was a tad frustrated that his 800 leg was impeded, and he made up for it by winning the open mile in 4:22.37. After a pedestrian open 1200, Daniel kicked hard for the win, closing in 60 for the last 400.